Iodine Deficiency is believed to affect all Americans! As I embarked on my adventure to explore the "why's" and "how's" of my cancer development, every doctor and practitioner considered my iodine levels (along with Vitamin D and Omegas). I was told that most cancer patients have iodine levels that don't even register on the tests! At the time I was told this, I had been taking an iodine supplement for about 6 weeks and still only registered a 2, with the goal to be in the range of 20. Clearly my body had some major catching up to do! Today, still, I take regular iodine supplement and sometimes will still test "low". So considering the ability to absorb iodine is also something to keep in mind. 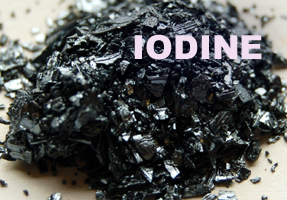 I encourage you to check out this article in full detail to better understand iodine and how it impacts our health, especially in the area of cancer development. Remember, the more we understand how and why our bodies allow for cancer to develop, the less fear we have and the stronger our ability to prevent and reverse it!